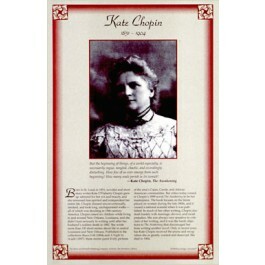 This unique educational poster features a photo of the 19th century American novelist and short story writer Kate Chopin, as well as a quote from "The Awakening," and concise biographical text summarizing her life and career. 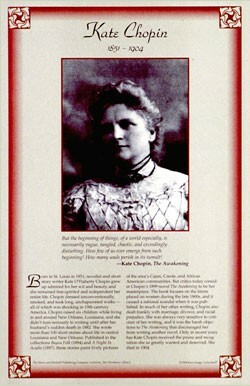 Kate Chopin wrote more than 100 short stories. But her masterpiece is considered to be her novel "The Awakening." This novel, which focuses on the limits placed on women during the late 1800s, caused a national scandal when it was published. This poster is a great way to introduce students to this groundbreaking female author.